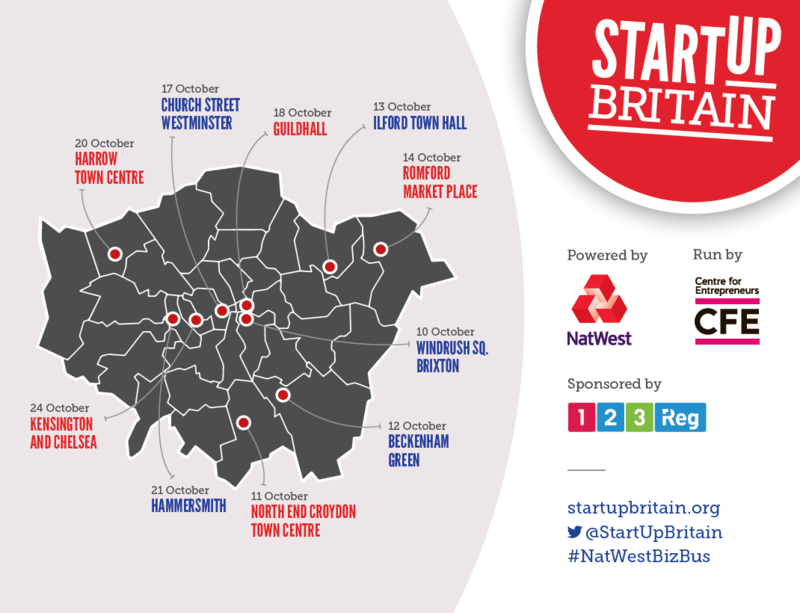 The tour will feature the NatWest Mobile Business School, a 1966 Routemaster Bus, which will park in high-footfall areas of 10 London boroughs offering free, impartial advice, celebrating entrepreneurial communities across London to connect and inspire individuals to turn their business ideas into a reality. The tour is set to visit 10 boroughs across the Greater London area, starting on 10th October and finishing in Kensington & Chelsea on 24th October. The bus will be taking prominent positions in Guildhall in City of London, Church Street in Westminster and Beckenham Green. It will also be visiting Ilford, Romford and Harrow among many others. StartUp Britain is a national campaign by entrepreneurs for entrepreneurs, harnessing the expertise and passion of Britain’s leading businesspeople to unleash entrepreneurship across the UK. The campaign is run by the Centre for Entrepreneurs think tank and sponsored by NatWest. Founded by eight entrepreneurs and launched in 2011 by the Prime Minister, StartUp Britain is completely private sector funded. It was launched in response to the government’s call for an ‘enterprise led’ recovery. Over the campaign’s duration, Startup Britain has pioneered a range of innovative initiatives to boost public awareness of entrepreneurship and support the growth of early-stage entrepreneurs. Since the campaign launched, start-up rates have increased from 440,600 in 2011 to a record-breaking 608,110 in 2015. Notable initiatives from StartUp Britain include four bus tours of Britain, engaging over 17,500 aspiring entrepreneurs in 60 towns and cities; popup shops; and PitchUp schemes through which entrepreneurs pitched their products to Britain’s largest high street stores.